For specific questions regarding youth camps and adult classes, please visit our Camp and Class FAQ page. Who needs a Participant Agreement, or Waiver? Every person who sails or paddles on a boat at Sail Sand Point must have a current Participant Agreement (previously known as our boat use waiver) on file. Beginning in 2018, if you sign the Participant Agreement online or in person it is good indefinitely, so no need to fill out another one unless you would like to update any of your information. Click here to fill yours out! Yes! Please apply for one if you have any hesitation about the cost of any of our classes. Scholarships can be given out for all classes and are appropriate for a wide variety of situations. Check out the scholarship page for information and the application. Explore class options and details using SSP’s online registration system. Registration opens on February 1st at noon for youth camps and adult classes. Sail Sand Point offers a range of classes for youth and adults who are just beginning to sail. Visit the Youth Camps and Adult Classes pages to read about these classes. We also offer reasonably-priced private lessons if our upcoming classes don’t work with your schedule, or if you are looking for 1-on-1 instruction. All SSP classes and lessons are taught by US Sailing-certified instructors. You have two great options. During the summer months, SSP offers FREE refresher lessons during Open Boating. These are designed to get sailors with previous knowledge up to speed and to teach you how to rig certain boats. Basic sailing knowledge is not taught in these classes. If you can’t take a Refresher class, you can schedule a Private Lesson with one of our US Sailing-certified instructors here. We offer Intermediate and Advanced classes for all ages. Read through descriptions of these classes on the Youth Sailing and Adult Sailing pages. Our US Sailing-certified instructors are also happy to tailor a Private Lesson to your interests. Of course, the best way to improve is to practice, so sign up for Open Boating and come down as often as you’d like! 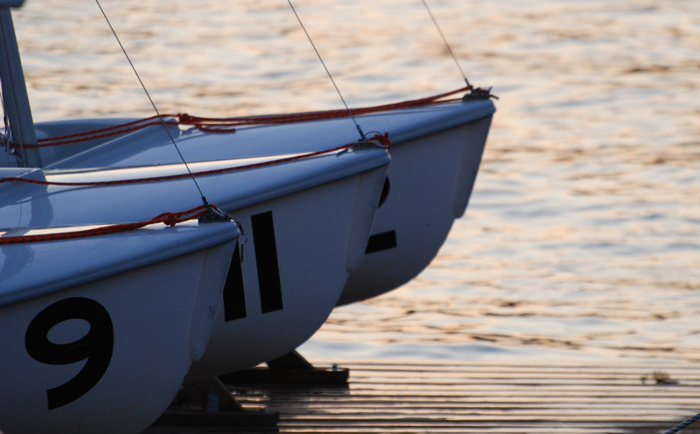 If you are comfortable sailing by yourself and would like to see what racing is all about, check out Youth Racing or Monday Night Racing (for adults). Rentals at Sail Sand Point are done through Open Boating, a program that allows proficient sailors to check out boats during Open Boating hours. For people who want to test out our boats before committing to a season pass, our boats are available at an hourly rate. For more information, see the Rentals page. Sailors who know how to sail simply need to pass a Skills Proficiency Test in order to use Sail Sand Point’s boats. What kinds of boats do you have? Do you have boats that are not sailboats? Our main sailing fleet consists of Optimists, Lasers, Flying Juniors, RS Quests, Hobie Waves, Hobie 16s, and 2.4mRs. We also have a fleet of windsurfers! Sail Sand Point also rents single and double kayaks and stand-up paddleboards (SUPs). Click here to go to Our Fleet page! Can I store my boat at SSP? A boat yard is available for small boats and kayaks that can be hand-launched and do not have motors. See the Boat Storage page for additional information, including fees and availability. All boats must be used at least 8 times per year to be kept in the SSP boat yard.